As I sit here listening to Prince on Spotify while trying to find the motivation to tidy my room up I glance at an old family photograph. 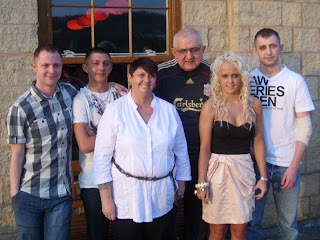 It is from just over 3 years ago on my dad’s 60th Birthday. All 6 of us happy and together enjoying a family occasion, I smile at the picture and then tears begin to roll down my cheeks. I only spoke to my youngest brother this morning yet I miss every single person in the picture & wish we were all living in our little house on Dryden Street all over again before everything fell apart. I focus on my dad wearing his favourite Liverpool shirt and his happy face. Before he died I have never worn a Liverpool shirt in my life, but after we all wore one for his funeral I find myself wearing it more and more often to remind me of my dad. A lot has happened in 3 years and that was truly the last time all my family were happy together. When my dad died in October last year, I was the only one in the picture not by his bedside. Sometimes I feel glad that I was not there to see the pain on his face in that hospital bed, but then I feel guilty. I was the oldest child and should have been there for my other siblings and my mum. Over the last year I have tried to hold it all together though and be there for my family. Everything else clearly suffered, the friends I pushed away, the friends that ran away, the failed relationships and my degree classification show that. I listened to Churchill’s advice a lot, I was going through hell and the only way to get through it was to keep going. At times mentally I thought I was done for, but some friends have helped, especially the ones that are still around now. My family has drifted so I feel like I failed them as well. Keeping myself away from the reminders of my father everyday was my coping mechanism. Every time I went back to Burnley it hurt an awful lot after my father’s funeral. I do not mean to seem distant from friends there or my family, it just holds memories that upset me. I haven’t visited all summer, I never took my nephew swimming like I promised or went for dinner with my siblings. I have just engrossed myself with working as much as possible and then got away to Malia at the end of the summer to have a blow out.. Recently I tried to organise some time away with my siblings but I might as well not have bothered. We are all slipping away from each other and that bothers me. It was met with much scepticism when I decided to study at university from lots of people. But 3 years later, I achieved what many people thought I could not see through to the end. I know I am not perfect and I have made lots of mistakes along the way, life is no rehearsal. I just wish I could see my father cry with pride one more time. Burnley, top of the league? Excusez-moi parlez-vous anglais s'il vous plaît?